Another milestone in relations between Canterbury and Rome took place in the Vatican on Monday as a traditional Anglican Choral Evensong was celebrated for the first time in St Peter’s Basilica. 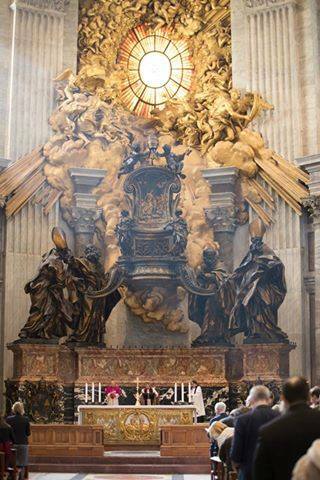 Anglican and Catholic bishops and clergy – including one female chaplain, Rev Dana English from the Anglican Church of All Saints Rome – gathered together at the altar below Bernini’s great bronze sculpture encasing the relics of the Chair of St Peter. Sunshine streamed through the giant alabaster window depicting the Holy Spirit as a dove, while the renowned choir of Merton College, Oxford, sang motets by the English Renaissance composer William Byrd, as well as some more contemporary works and well-loved Anglican hymns. The director of Rome’s Anglican Centre, Archbishop David Moxon presided at the liturgy, which took place on the day that Pope Francis marked the fourth anniversary of his election to the pontificate. The Secretary of the Vatican’s Congregation for Worship and the Sacraments, Archbishop Arthur Roche gave the sermon, highlighting the humility and missionary zeal of Pope Gregory the Great who sent Augustine, prior of a Benedictine monastery in Rome, to evangelise the English in the year 597. Speaking of the “remarkable ecumenical nature” of Gregory’s ministry, the Yorkshire born Archbishop said “it’s not enough for us to simply remember” his legacy, but rather we must also become “missionary Christians”, praying and working “to surmount the barriers that remain”. The liturgy concluded with a procession to the tomb of St Gregory to pray for the Church and its leaders, an event Bishop David Hamid of the Anglican diocese in Europe described as a “very moving and significant ecumenical moment”. The celebration came just two weeks after Pope Francis made an unprecedented visit to All Saints in Rome and just five months after he and Archbishop Justin Welby celebrated Vespers together and sent out on mission pairs of Anglican and Catholic bishops from the Rome Basilica of St Gregory on the Caelian Hill. Merton College Choir followed in the footsteps of Westminster Abbey choir, which has sung previously in Rome with the choir of the Sistine Chapel – a collaboration that has grown out of closer ties between the two traditions, in particular following Pope Benedict XV1’s visit to London in September 2010.